Make a Variety of Popups Fast and Easy! Preview in the Browser and in your webpage on your local computer while you work. Browse your hard drive to select images. Several ways to launch, print, and close popups. Upload your files by drag and drop or copy/paste or use your own favorite FTP program. Show or Hide browser Menu Bar, Toolbar, Address Bar, Links Bar, Scroll Bars and more. Make a Variety of Popups without writing a single line of code. ...... Popup Full Screen. Show or Hide popup window Menu bar, Toolbar, Address bar, Links bar, Scroll bars and Status bar. Allow popups to be resized. 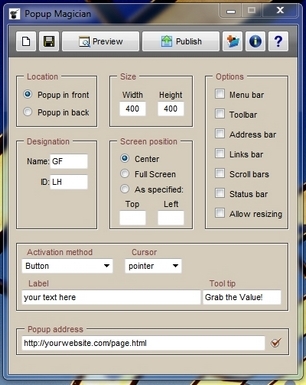 Choose where you want to place your popup on the monitor screen or have it centered within the screen. Several ways to print and close popups. Upload your files by drag and drop or copy/paste or you can use your own favorite FTP program. No additional costs. Unlimited websites. Generate various popups quickly and easily with powerful WisePopup! BanPopup assists by preventing unwanted pop-up windows. RealPopup, the freeware full featured winpopup replacer for your lan! Qweas is providing links to Popup Magician 4.8.4 as a courtesy, and makes no representations regarding Popup Magician or any other applications or any information related thereto. Any questions, complaints or claims regarding this application Popup Magician 4.8.4 must be directed to the appropriate software vendor. You may click the publisher link of Popup Magician on the top of this page to get more details about the vendor.